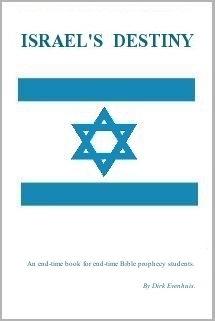 "Israel's Destiny" was written at the close of the eighties as an aid to Bible prophecy students. It is written in simple, straight-forward language by a layman for laymen. The author's father was converted from the traditional views of the Reformed Churches to a realisation of the immutability of God's covenants and promises to the circumcised seed of Abraham Isaac and Jacob. Hence we have the culmination of two generations of study on this exciting and absorbing subject. These two men have greatly rejoiced in the salvation that has come to the gentiles through Israel's Messiah. They have also felt a great debt of love to the Jewish people and Israel. "Israel's Destiny" is void of sensationalism and is not written out of a mere fascination with Bible prophecy. It was written out of a great love for the God of Israel and His faithfulness to His covenants and promises.